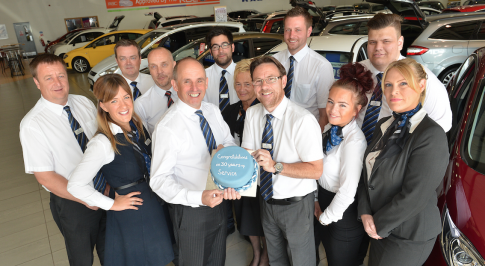 Bristol Street Motors Ford Worcester has helped one of its colleagues celebrate 30 years of loyal service. Pete Brampton (53) joined Bristol Street Motors in 1984, starting work at the original dealership in Birmingham before moving to Worcester in 2009. Working as a used car sales executive Pete, who lives in Bromsgrove, estimates he has sold more than 6,000 cars. He believes that the two main attributes for a successful salesperson are a focus on delivering the best customer service and a sense of humour. When not at work Pete enjoys the outdoors; football, fishing walking and gardening and he plays guitar in two bands covering classic rock tracks and aiming to emulate his guitar hero Jimi Hendrix. Pete Brampton said: I have seen changes over the last 30 years but have always enjoyed my role, have worked with some fantastic colleagues and met many satisfied customers. Simon Parsons, General Manager at Bristol Street Motors Ford Worcester, said: Pete embodies the Companys key values of passion, respect, professionalism, integrity and commitment.